Guo Liang Chen won the 2017 World Poker Tour Borgata Poker Open $3,500 buy-in no-limit hold’em main event, outlasting a field of 1,132 total entries to capture the title and the $789,058 first-place prize. This was by far the largest score of his life, with his biggest previous cash being for only $13,858. Here are the five biggest hands that propelled Chen to the win. After his pocket kings held against Paul’s Q J to double up, it only took a few hands before the two tangled again. This time Chen raised to 260,000 from middle position and Paul called from the big blind. The flop fell 7 4 2 and Paul checked. 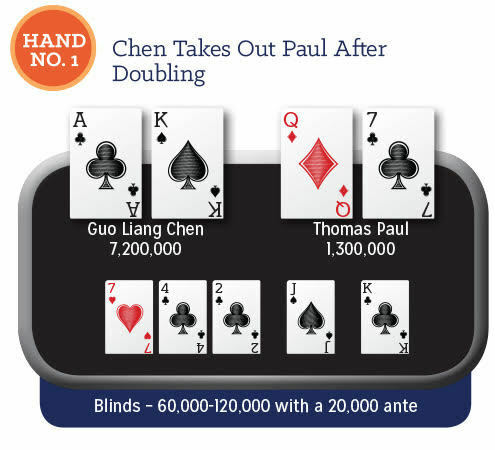 Chen moved all-in and Paul snap-called with Q 7 for top pair. Chen only had A K for ace high, and was down to his final six outs when the J hit the turn. Paul was looking good for a double up, but the K hit the river to send him to the rail in sixth place. He earned $161,247 for his final-table run. 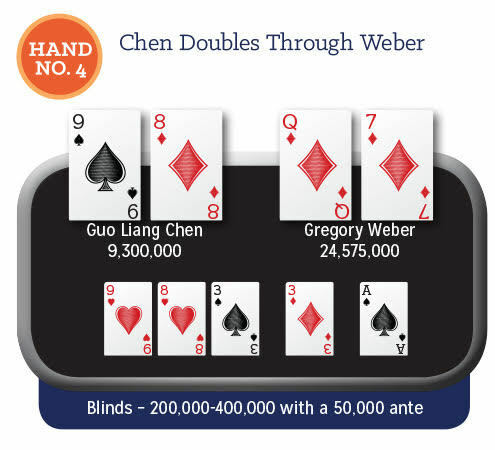 Chen raised to 325,000 from under the gun and Weber defended his big blind. The flop came down 7 6 2 and Weber checked. Chen bet 325,000 and Weber called. The turn was the A and Weber checked again. Chen bet 775,000 this time, and Weber called once again. The river was the 8 and Weber checked for a final time. Chen took his time before putting out a bet of 2,100,000. 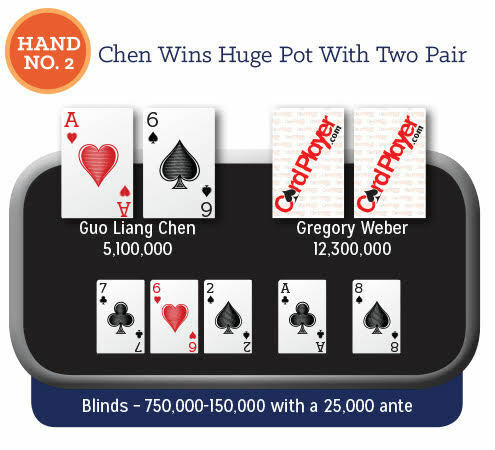 Weber went into the tank for more than a minute before eventually calling, and Chen turned over A 6 for turned two pair to scoop the huge pot. 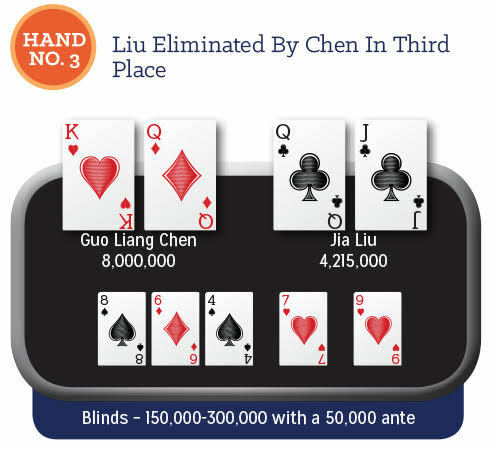 Liu moved all in from the button for his last 4,175,000 and Chen asked for a count from the big blind. After hearing the amount, he made the call with K Q , and was happy to see that he has Liu’s Q J dominated. The board ran out 8 6 4 7 9 and Liu exited the tournament floor. He earned $288,071 for his third-place showing, while Chen entered heads-up play with Weber at a nearly 2:1 chip disadvantage. After building on his heads-up chip lead, Weber raised to 1,000,000 on the button. Chen called and the flop fell 9♥ 8♥ 3♠. Chen checked and Weber bet 1,000,000. Chen called and the turn was the 3♦. This time Chen bet 1,500,000 and Weber called. The river was the A♠ and Chen checked. Weber moved all in, and Chen got out of his chair. After a bit, he tossed in some chips to signify a call. Weber turned over Q♦ 7♦ for a pure bluff, and Chen’s 9♠ 8♦ was enough to claim the pot and give him the chip lead. Down to his last ten big blinds, Weber moved all in from the button and Chen called with A K . Weber was dominated with K 9 and needed help to stay alive in the tournament. The flop of 7 5 4 kept Chen in the lead, but Weber picked up chop outs with the 3 on the turn. The river was the Q , however, and Weber was eliminated. He pocketed $471,059 for his runner-up performance. 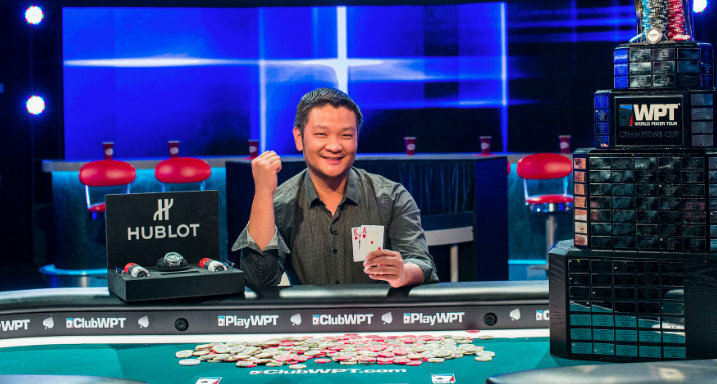 In addition to his first WPT title, Chen took home the trophy and the $789,058 first-place prize.